The hard part is done. Wow, was it hard to get those studs and nuts off. The next step is to find new parts. In most cases I go to an auto parts store, such as Advance Auto for a good deal on parts. However, my internet research turned up some troubling failures on the China-made manifolds these stores sell. They have cracked way too soon. Even my brother-in-law has a story of multiple replacements with those parts. Sure they were under warranty. But his labor wasn't. In the end he went to Ford for the parts. So that's what I did. The manifold I bought has casting marks that look like it was forged in the same Canadian foundry that made the original. That gave me a feeling of confidence. The original lasted 13 years. In fact, I went OEM all the way on this job, right down to the studs and nuts. I swallowed hard at the $183 manifold and harder at the two $31 gaskets. All told parts were $300. Enough about parts. I had to do some extra surface preparation on the leaking rear port. The corrosive exhaust gases had eaten away a bit of the surface of the head. I made about three applications of JB Weld, filing it flat in between applications until I was satisfied the surface was smooth and flat. 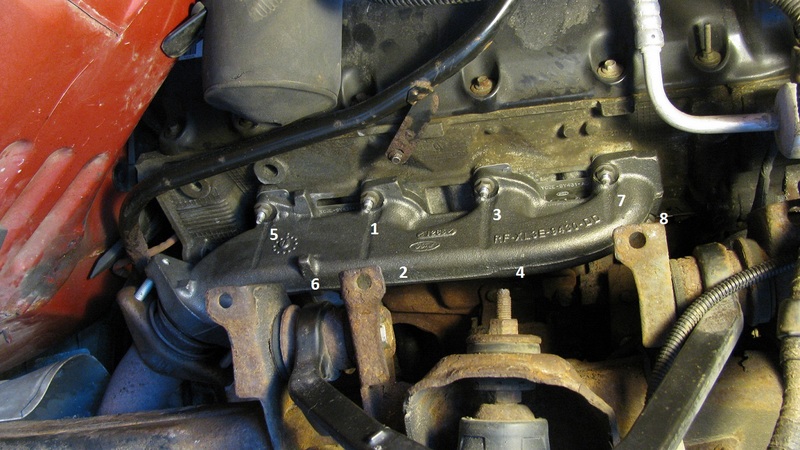 1) Thread the studs into the manifold flange (where the manifold meets the exhaust down pipe). They will bottom on the rings. They cannot be put in after the manifold is mounted. 2) Thread the eight manifold mounting nuts a little way onto their studs. 3) Fit the manifold onto the exhaust down-pipe by feeding the studs through the holes on the sliding bracket on the pipe. Do not put the nuts on yet. 4) Get a gasket and align it with an upper mounting hole on the manifold and thread a stud through and into the head just a few turns for now. 5) Align the other hole in the gasket and thread another upper stud and nut into the head. 6) Repeat on the other end of the manifold. All upper studs should now be in place. 8) Now begin to turn in the eight manifold nuts torquing them in stages to 17-20 ft pounds, per the sequence below. 9) Bolt the exhaust down-pipe to the manifold with a 15mm 1/2" drive socket and ratchet. Torque to 25 to 34 ft lbs. 10) Bolt the starter wiring harness back down with a 10mm socket. 11) If the starter was removed, bolt it back in place and wire it back up. 12) Hook the battery back up. 13) Jack it up high enough to remount the wheel and remove the supports.Set it back down. 14) Once down, torque the lug nuts. 15) Fire it up and listen and feel for any leaks. Mine was quiet. This calls for a two beer celebration! 16) Remount the wheel well cover with the five 7/32 hex screws and four panel fasteners. Man thank you so much.the cutting the nut off trick work like a champ! Then I used a stud remover with pb blaster.work awesome just awesome! Way to go! That is a tough job you just got done. 03 F-150. Thanks for the help! #7 cyl upper and lower stud bolts were a nightmare. broke off two extractors on the #7 upper, almost lost the head. My mistake, Waiting almost two years to take care of this leak. This must be a common issue with the 5.4's. Although I cannot complain, this has been the first major work I've had to do on this truck since buying it new. I Appreciate you and those like you for sharing your talents online. Thank You! You're very welcome and thanks for the comments. Yeah this is pretty common on these trucks, I think. I too, have had little if any other trouble with mine. Fantastic post. Greatly appreciated. Just finished my 2005 F150 Lariat 5.4L. Had warped manifold resurfaced ($20) at Johnny Franklin Muffler (Great Helpful Shop). Good tips all. Thanks for the helpful comment! Question, After running the engine and getting it up to normal operating temp, would you recommend re-torquing after it cools down. I don't know if that's necessary. All I can say is that I never re-torqued them and I haven't had any problems. It's almost three years ago that I did mine. The OEM studs were prone to braking especially on cylinders 4 & 8. The fix is a change-up stud from Ford which is made of stainless steel with a copper plating to prevent corrosion in the aluminum head. Part # is -W703902-S403. I have used Fel-Pro gaskets exclusively for 15 years in this application and have never had one leak.